FA: Vern Clevenger, Bruce Chimilesk, July 1971. Mosquito is the “passing lane” for Great White Book. An easy crack to runout slab leads either back to the anchor on pitch 3 of Great White Book, or to the anchor for pitch 3 of Dixie Peach. From there, Mosquito joins Dixie Peach, allowing access to the upper pitches of Dixie Peach at a more moderate grade, but bypassing the best climbing. Which SuperTopo guidebooks include a topo for Mosquito? This line ascends splitter cracks to face moves. 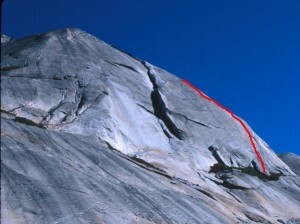 This route ascends a flake in the mirror-image of California. Stately Pleasure Dome above Tenaya Lake. A great combination of crack and face climbing.